George W. Crawford et al. To announce Georgia's formal intent to secede from the Union. 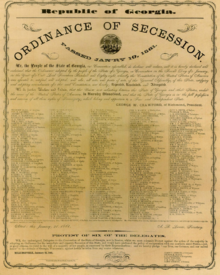 An Ordinance of Secession is the name given to multiple resolutions drafted and ratified in 1860 and 1861, at the beginning of the Civil War, by which each seceding Southern state or territory formally declared secession from the United States of America. South Carolina, Mississippi, Georgia, and Texas also issued separate documents explaining their reasons for secession. Thirteen states and one territory ratified an ordinance of secession, typically by means of a special convention or by referendum. Of these, only 11 states and one territory authoritatively made secession effective by a regular means, ultimately driven by state government reliably backed by public opinion and military force. The other two states seceded ineffectively or only by an irregular means, and hence remained within the Union. The first seven seceding states, all of the Deep South, were motivated mainly by two factors: the election in November 1860 of Abraham Lincoln, who had no support in the South, and the perceived direct threat to slavery his election posed. The next four states to secede also were motivated by the same two factors, but a third and decisive factor was the Federal policy of coercion, or using military force to preserve the Union by compelling the earlier seceding states to submit. In the remaining two states, attempted secession was belated and severely disrupted. In Missouri, the state government called a convention, but its members disfavored secession. Federal military intervention quickly restored Union control, first in St. Louis, then throughout nearly the whole state. Its ordinance of secession eventually was passed only by a rump convention meeting at Neosho. In Kentucky, whose potential secession Unionists particularly feared, both the legislature and public opinion firmly opposed secession. Only an even less influential rump convention purported to secede. When Confederate armies invaded Kentucky in 1862, briefly seizing the state capital and installing an ephemeral state government, they found local recruitment weak and popular support conspicuously lacking, despite bringing extra arms to equip new volunteers. This unexpected discovery helped defeat the campaign as the Confederate generals felt they lacked the strength of numbers to confront the larger Union forces that eventually maneuvered to oppose them. Despite Missouri and Kentucky thus remaining within the Union, thousands from both states embraced secession by choosing to fight for the Confederacy. Though generally accepted only to have comprised 11 seceding states, these 13 states and one territory formed, by its own contemporary definition as shown by 13 stars in its official and battle flags, the Confederate States of America. Elsewhere, overwhelming Union military intervention and mass arrests of elected lawmakers blocked the secessionist Maryland legislature even from considering the question. The Delaware legislature did, quickly and overwhelmingly rejecting secession. The unorganized Indian Territory did not document secession and was not unanimous in its orientation, but generally supported the Confederacy. In several states, effective secession in most of the state critically destabilized or virtually eliminated state government control over a region where people widely rejected secession, favoring the Union over their state. This was particularly true of Virginia, leading to the creation of West Virginia. The same effect occurred in part of Tennessee and in other areas, but did not result in any split of other states. ^ Curry, Richard O. (1964). A House Divided, Statehood Politics & the Copperhead Movement in West Virginia. University of Pittsburgh. p. PA49. ^ ""An Ordinance to dissolve the Union between the State of South Carolina and other states," or the South Carolina Ordinance of Secession, South Carolina, 1860". TeachingUSHistory.org. Retrieved April 11, 2017. ^ "Mississippi". 1starnet.com. Retrieved April 11, 2017. ^ "Florida". 1starnet.com. Retrieved April 11, 2017. ^ "Alabama". 1starnet.com. Retrieved April 11, 2017. ^ "Georgia". 1starnet.com. Retrieved April 11, 2017. ^ "Louisiana". 1starnet.com. Retrieved April 11, 2017. ^ "Texas". 1starnet.com. Retrieved April 11, 2017. ^ On January 19, the Tennessee legislature in special session beginning January 7 required that approval of a possible secession convention be put to referendum on February 9. Voters rejected the convention, and by extension, any secession. Had it convened, it would have been overwhelmingly pro-Union. Thousands of pro-Union voters voted for a secession convention in the hopes that the convention would fail to the public embarrassment of secessionists. ^ "Virginia". 1starnet.com. Retrieved April 11, 2017. ^ "Arkansas". 1starnet.com. Retrieved April 11, 2017. ^ Public opinion had shifted dramatically, most notably in Middle Tennessee. ^ "Tennessee". 1starnet.com. Retrieved April 11, 2017. ^ "North Carolina". 1starnet.com. Retrieved April 11, 2017. ^ "Missouri". 1starnet.com. Retrieved April 11, 2017. ^ "Kentucky". 1starnet.com. Retrieved April 11, 2017. South Carolina's Ordinance of Secession Text and original document from the South Carolina Department of Archives and History. Virginia's Ordinance of Secession (enrolled bill) Text and original document from the Library of Virginia. Virginia's Ordinance of Secession (signed copies) Text and original documents from the Library of Virginia and National Archives. Texas Declaration of Causes, Feb. 2, 1861 Text of Declaration of Causes from Texas archives. This page was last edited on 8 March 2019, at 22:06 (UTC).